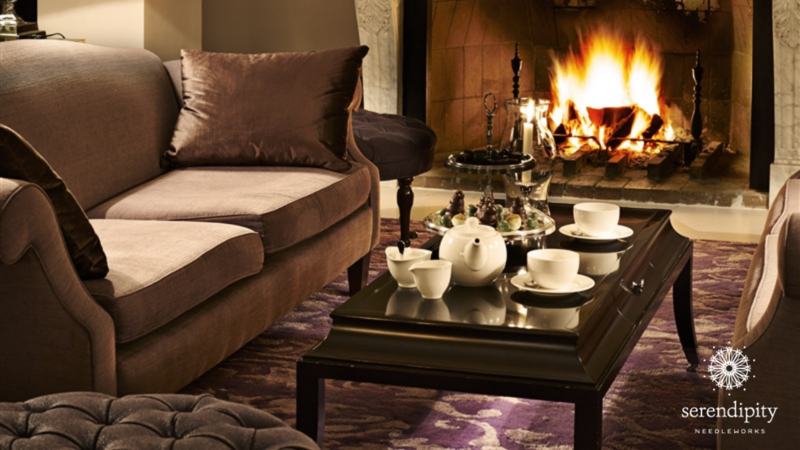 Hygge (pronounced “hoo-gah”) means creating a warm, cozy atmosphere and enjoying good things with good people. It’s a way of life in Denmark. That’s why we’re exploring the essence of “hygge” here in Copenhagen. 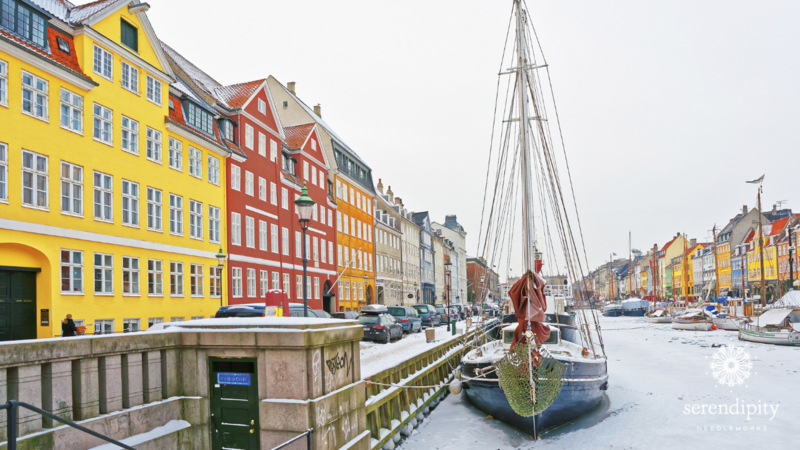 You see, the Danes are the happiest people in the world, according to the World Happiness Report, and I’ll bet we can uncover some of their secrets while we’re visiting. 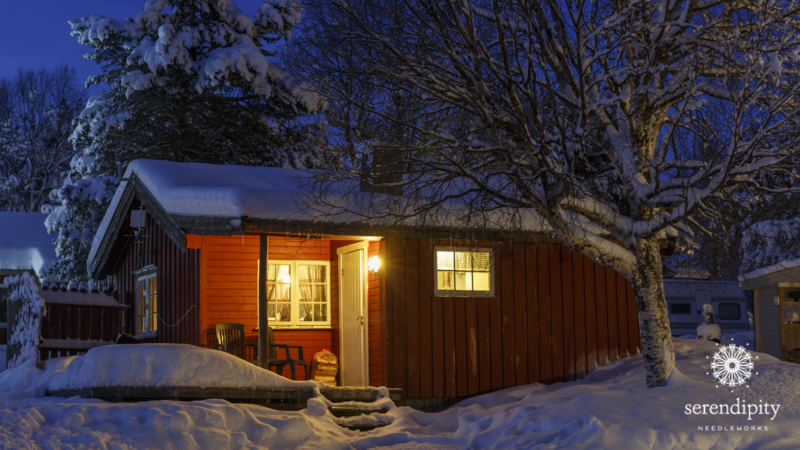 So, what exactly is hygge? 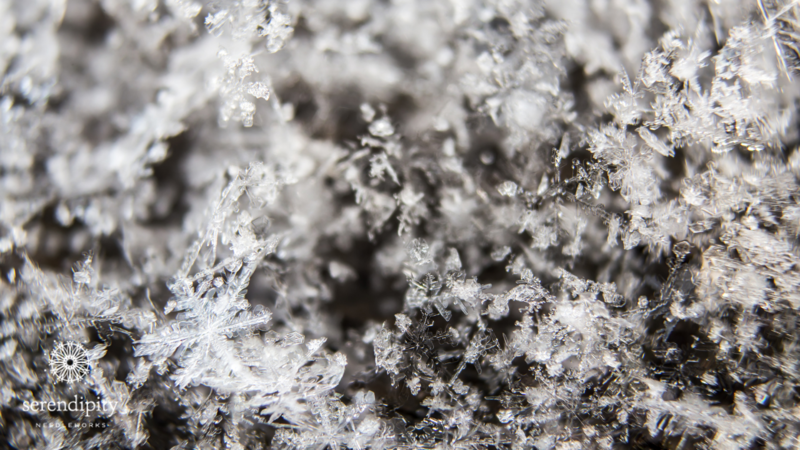 It could be the cheerful glow of candlelight, snuggling under a squishy blanket by the fire, or wearing a soft fuzzy sweater while enjoying a steaming cup of gløgg. 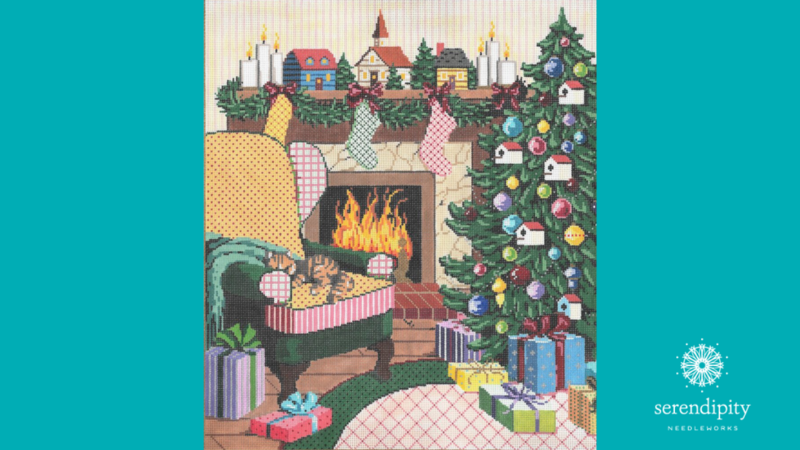 Ready to try your hand at adding a wee bit of hygge to your needlepoint projects? Candles provide natural light and natural light makes us feel better than an electric light. 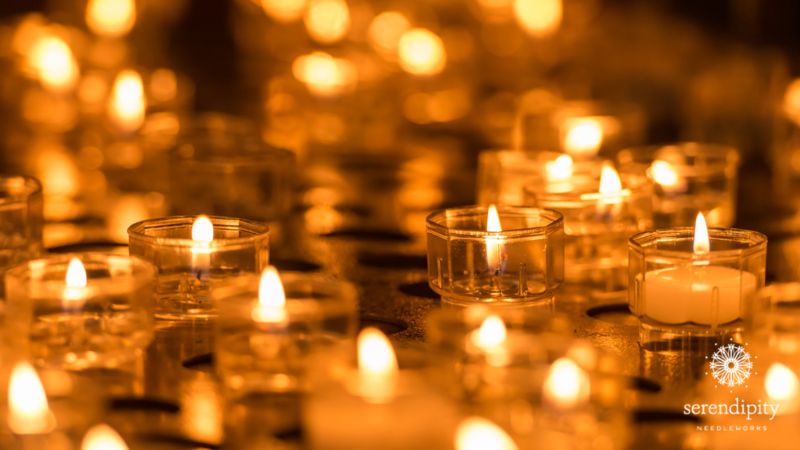 The Danes call candles “levende lys” which means living light. And that makes perfect sense, don’t you think? The flickering flame of a candle really does look like it’s alive! 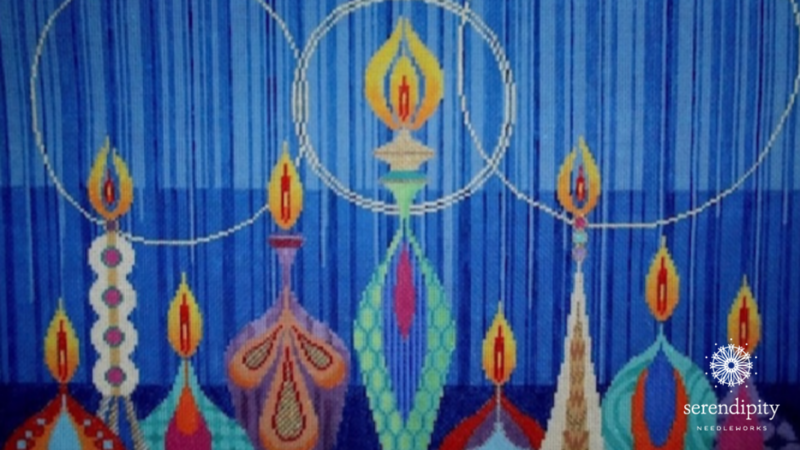 So, how can you stitch the candles on your needlepoint canvases, like this one from Tapestry Fair, so they look real? Great question! The upright Gobelin stitch creates truly realistic candle flames. It’s super easy to execute – and it’s also easy to compensate. It’s one of those stitches that you can always count on and it’s a terrific choice for beginning stitchers or if you’re new to using decorative stitches on your canvases. Execute this stitch from top to bottom – back and forth in horizontal rows – in an area, following the numbers on the stitch diagram above. 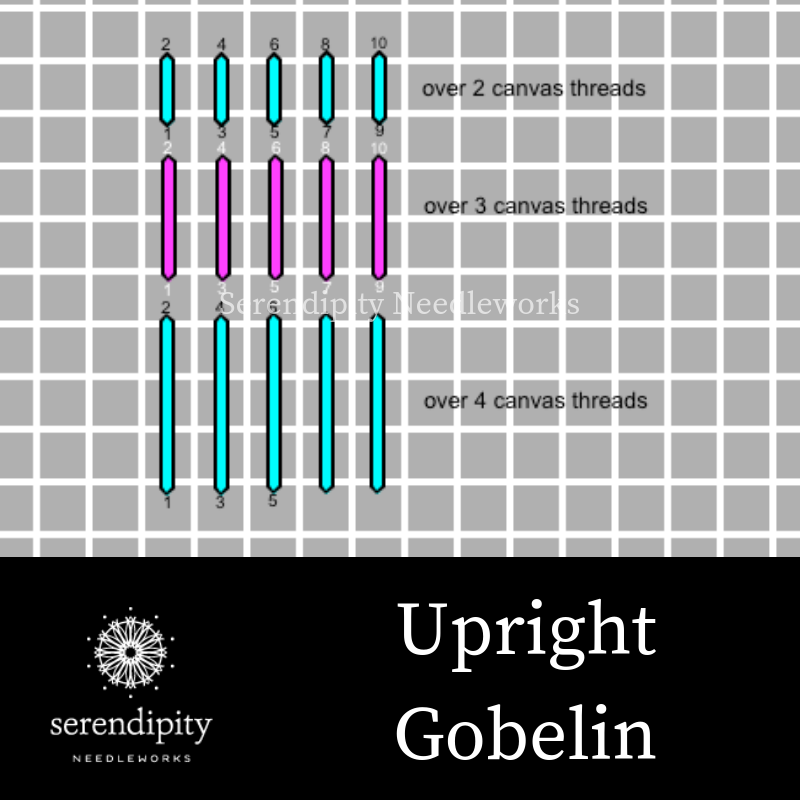 Upright Gobelin is a straight stitch, so be sure and use a thick enough thread if you’re trying to achieve full coverage on your canvas. You can work it over 2 – 6 canvas threads, but I prefer working it over 2, 3, or 4 threads. It’s a smallish stitch so it’ll fit in just about any space. I’m using Water n’ Ice to work the Gobelin stitch. Water n’ Ice is a loosely braided translucent ribbon-type thread. It is 100% nylon and is available in 18 colors. Each card holds 10 yards. I recommend using it for long stitches on 13 – 18 mesh canvas. While Water n’ Ice can be a little finicky to work with, it’s well worth the effort – especially on painted canvases where you want the color to show through. It has a tendency to fray, so use Fray Check or a Thread Zap to treat the ends and use short pieces (no longer than 15″). You have two options when using Water n’ Ice to stitch a candle flame. You can work the Gobelin stitch in the clear color (WT12) and allow the paint to show through. 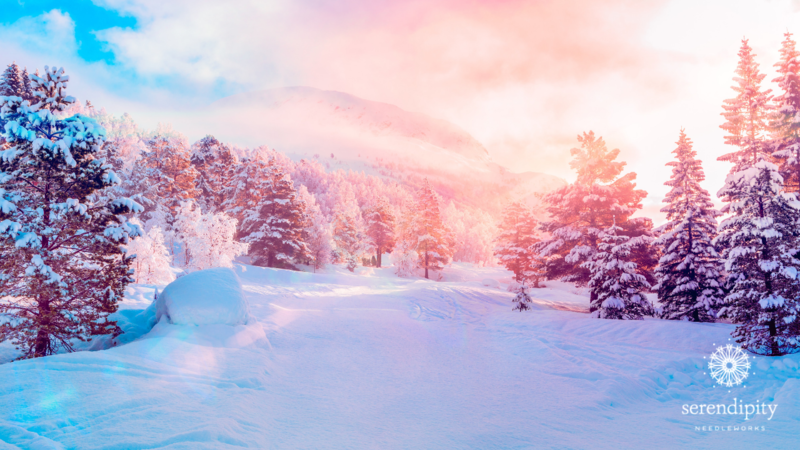 Or you can use different colors of Water n’ Ice to add more depth of hue. Use the stabbing method to stitch – come straight up through the canvas and take your needle to the back straight down through the canvas – being careful not to drag your thread along the surface or pull it at an angle. And be sure to use a laying tool. I’m using one strand of Water n’ Ice (WT12) in a #22 tapestry needle to work my stitch sample on a piece of 13 mesh needlepoint canvas. Oh – and you can also use this stitch/thread combo to stitch blazing fires on your needlepoint projects – like the one you see in this canvas by Sandra Gilmore. And now, here we are back at our beautiful Hotel d’Angleterre. 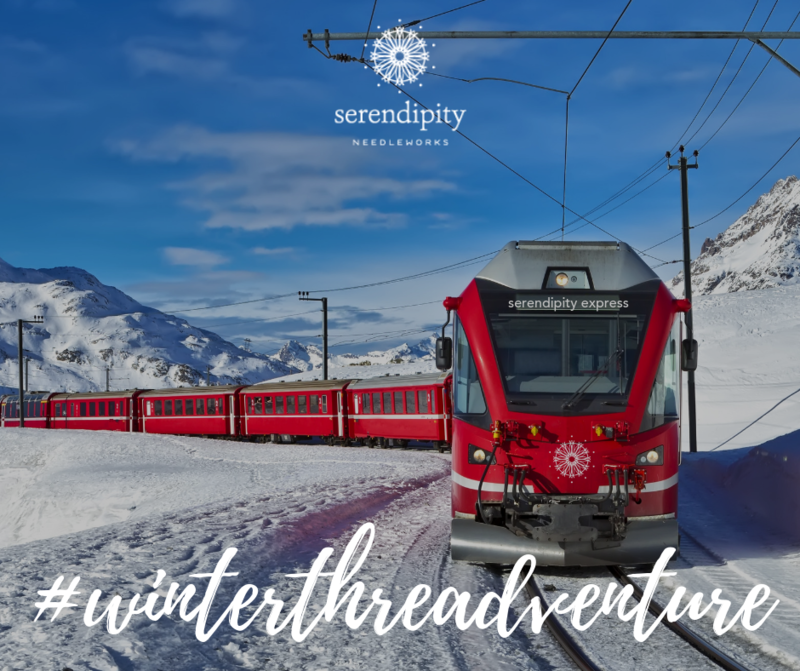 PS: If you’re new to the Serendipity Needleworks family – or just discovered my blog, click here for more info on what a Threadventure actually is. And click here to read about the other destinations on our 2019 Winter Threadventure through Scandinavia. snowy Narvik. And here we are!!! 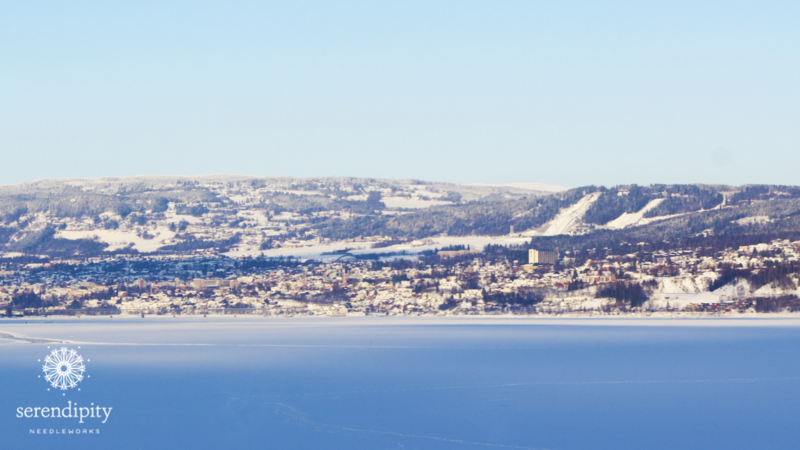 Narvik is one of the northernmost towns in the world. It lies on the shores of the Ofotfjord, an inlet of the Norwegian Sea. And even though it’s 120 miles north of the Arctic Circle, Narvik’s port is ice-free year-round, thanks to the North Atlantic Current. Ironically, that same North Atlantic Current provides Narvik with a milder climate than you might expect for a place that sits on such a northerly latitude. But still, there’s a lot of snow! 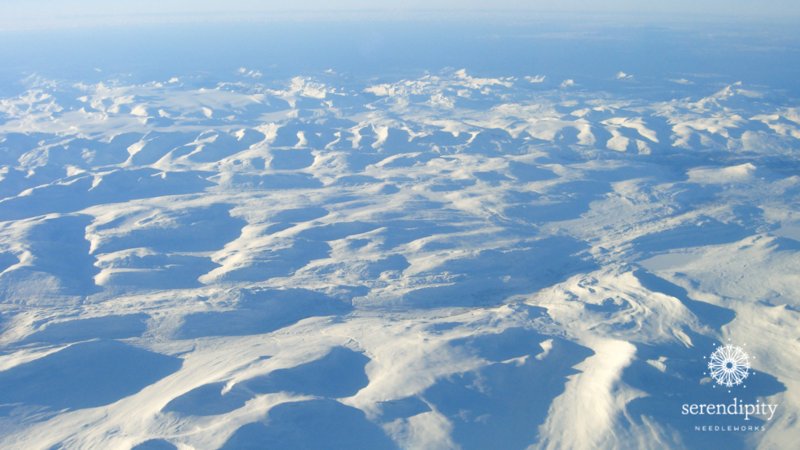 The Scandinavian Mountains – the ones you see in that picture up there 👆- are a country-long chain of peaks that is geologically continuous with the mountains of Scotland and Ireland in Europe. That same chain crosses the Atlantic Ocean and re-emerges in North America as the Appalachian Mountains. And Tuscaloosa is right at the base of the foothills of the Appalachians. Pretty cool, huh? Those snow-covered mountains offer some of the finest skiing in the world. 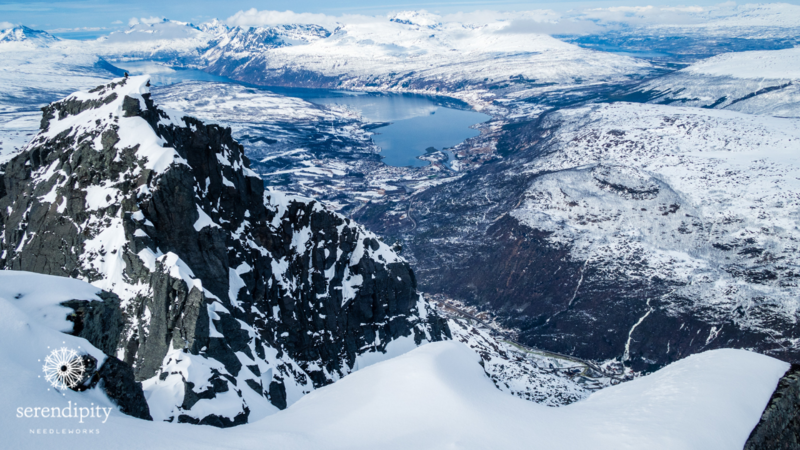 Did you know that nearly one-third of Norway’s landmass is above the tree line? That means trees can’t grow there, so the landscape is pretty stark. Mostly, you’ll see snow covered mountains and glaciers. 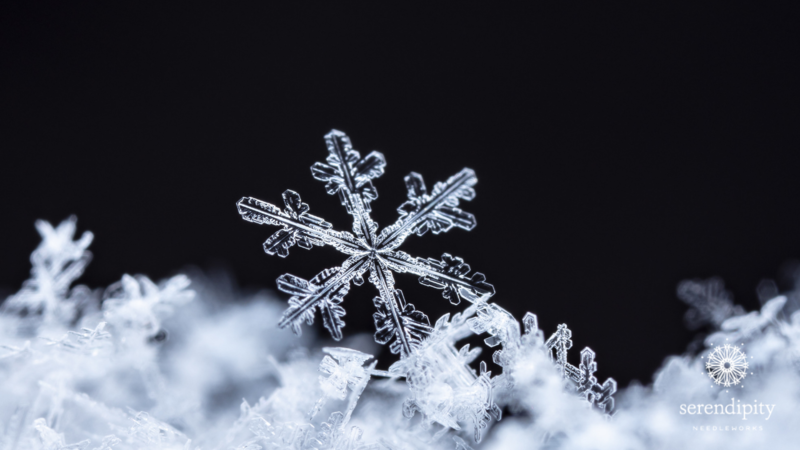 Today’s stitch, the Nobuko stitch, is a terrific option for snow. It’s particularly effective for stitching smooth snow. 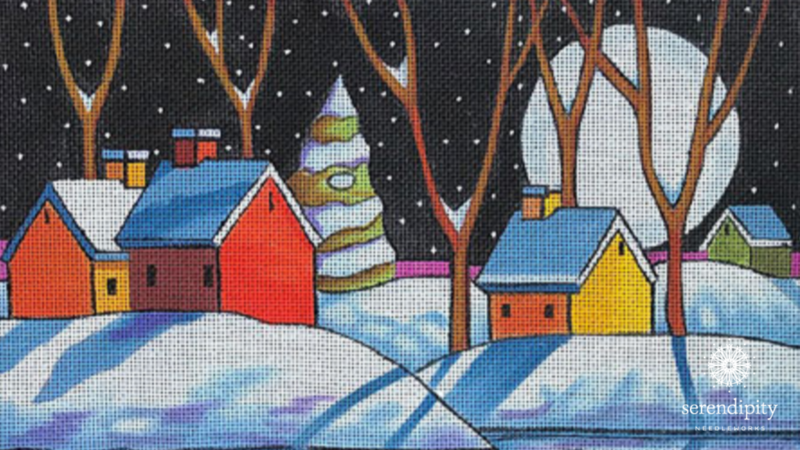 Think new-fallen snow as you see in this canvas by Maggie and Co., “Night Snow Reflection”. Freshly fallen snow doesn’t have much texture and the Nobuko stitch implies just enough movement to create subtle depth and dimension for gently rolling hills. You may also reverse the slant of your stitches to alter directionality. Let’s take a look at the stitch diagram. 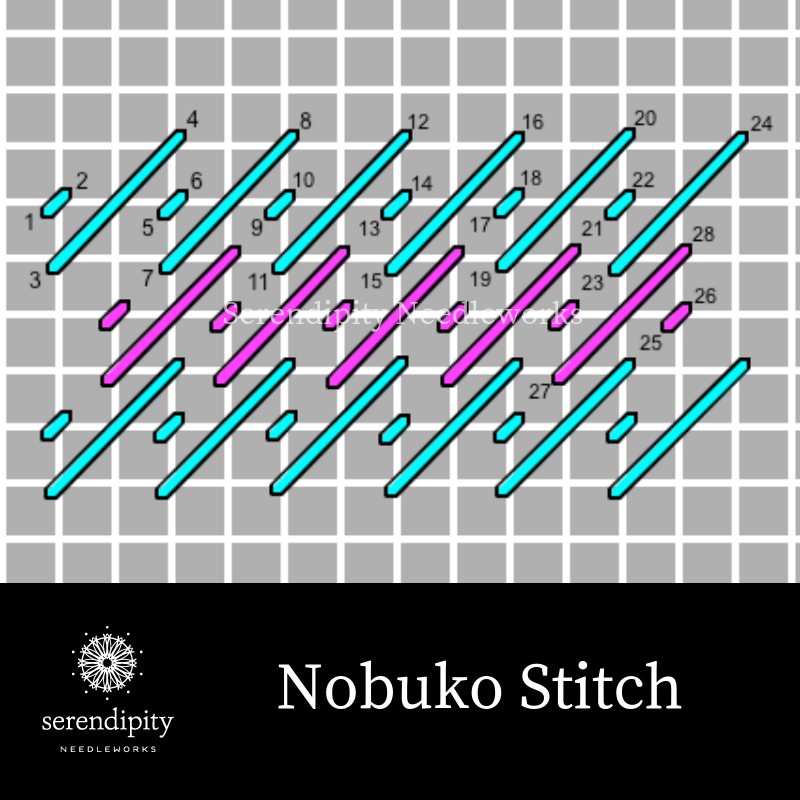 You can see that the Nobuko stitch is a true diagonal stitch. What does that mean? Great question! A true diagonal stitch lies across the same number of vertical and horizontal canvas threads. The short tent stitch lies across one vertical and one horizontal canvas thread (i.e., intersection) and the longer diagonal stitch lies across three vertical and three horizontal canvas threads. For example, when you bring your needle to the front of the canvas at number 3, you then count over to the right three vertical canvas threads and up 3 horizontal threads to arrive at number 4, which is where you take your needle to the back of the canvas to complete the stitch. Make sense? Terrific! 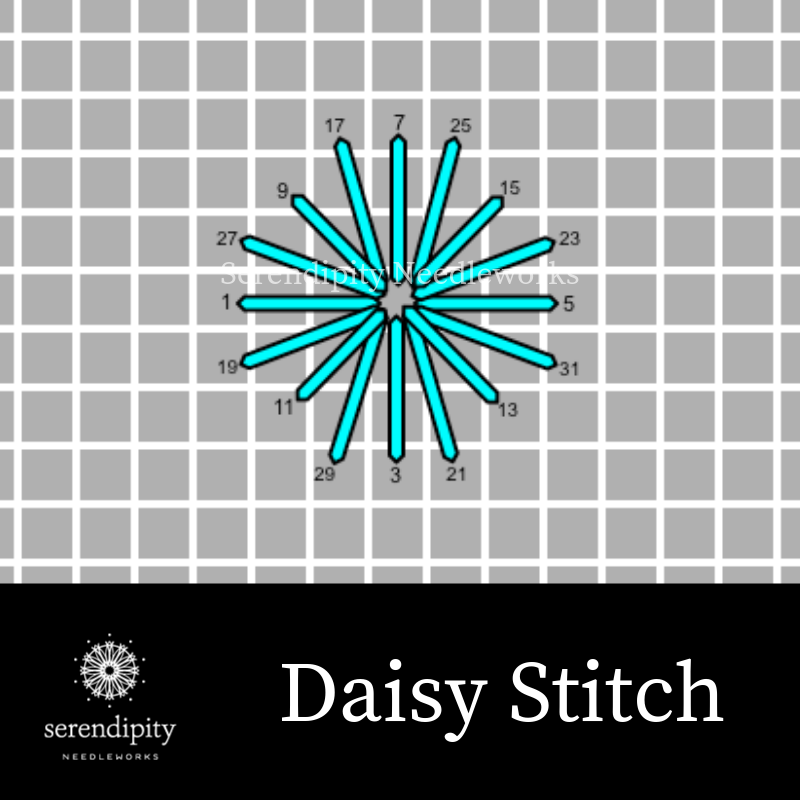 And remember, as long as you use the stitch diagram as your roadmap for where to place your needle, you’ll be golden! The Nobuko stitch is a smallish stitch so it’ll work on a variety of canvases – from ornaments to pillows. It’s also a terrific background stitch. I’m using two threads to work this stitch. First, I’m using Neon Rays to work the long stitch in the Nobuko stitch. Neon Rays is making an encore appearance and you can click here learn more about it. And the other thread I’m using for the Nobuko stitch is Kreinik Tapestry Braid #12. It’s made of synthetic fiber that is tightly braided together by a machine to become a single strand of thread. Kreinik Braids are metallic threads that you can use “as is” – straight off the spool. (Don’t separate them.) They add the beautiful shimmer of a real metal thread, but in a material that’s easier to use, less expensive, washable, and more readily available. It’s not particularly prone to fraying, but you can certainly use a Thread Zap or Fray Check on the ends if you want. I’ve found that it helps to “tame” Kreinik braid by running it between my fingers about 10 times before I thread it into my needle. Oh – and be sure to use shorter pieces (no longer than 15″). I’m using Kreinik Tapestry Braid #12 to work the short tent stitches in the Nobuko stitch. Use one strand of Neon Rays (N102) in a #22 tapestry needle to execute the long stitch in the Nobuko pattern. And use one strand of Kreinik Tapestry Braid #12 (032) in a #22 tapestry needle for the short tent stitch to complete the Nobuko stitch pattern. Work your stitch sample on a piece of 18 mesh needlepoint canvas. Use a laying tool to lay your thread smoothly on the surface of your canvas for the best effect. Where will you use the Nobuko stitch? Don’t be shy – I ❤️ hearing from you and I read every single note. And since Valentine’s Day is next week, I think I’ll do a fun giveaway. Alrighty, that’s all for now.